In the middle of June, the Greek government faced a never ending protest movement. Dissent was rising in the streets and in the governing majority. News spread that the prime minister had resigned. Later we found out we had only offered to step down in favor of a grand coalition. Then, he retracted that offer and instead sacked his cabinet and said he would seek a vote of confidence with a new cabinet. Within twelve hours, every analyst (myself included) was writing off the PASOK government. Deputies resigned. An urgent meeting of the government council was called - the government was falling. Spreads were going through the roof and there was talk that the IMF and the Europeans would not release the fifth installment of the €110 billion package. Greece would default. Instead, the cabinet reshuffle did the trick: the new cabinet got a vote of confidence. Days later, the medium-term strategy, the cornerstone of the government's new reform agenda, passed amidst rolling blackouts and demonstrations outside parliament where protestors clashed with the riot police. Flames, tear gas and images of savage violence once again tarnished the country's image. Then things calmed down. Foreigners praised the government for its resolve. The outburst of violence settled. The stage moved from Syntagma Square to Brussels. The new numbers underscored Greece's dire position. So far, it seemed that country had until 2012 to get a second bailout - that's when time run out on a couple of long-term bonds coming due. But increased bank support meant the country faced a growing deficit in 2011. The reckoning date was pushed forward. And yet there was no consensus on what to do. Clearly, Greece needed either a second package or a default. But the Europeans could not settle on the terms for that second aid - chiefly, they were looking for ways to share the burden with Greece's current debt holders. Their decision - taken on July 22 - involved a new aid package but with private sector participation but not a technical default. So where does Greece stand now? Greece's fortunes now depend on Europe's politicians rather than the market. Based on the first bailout package, Greece would need to satisfy quarterly criteria to secure each aid installment until 2012, after which time it would need to raise funds from the markets directly. That prospect has now been extended until 2014 or later. Greece can more or less ignore market sentiment for 2-3 years. That cushion should give the country more time to restore growth and return to borrowing from a position of strength. That is the good news. The bad news is that the underlying challenges are no easier now. 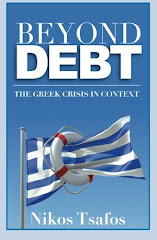 The reform agenda is still ambitious and requires a deep restructuring of the Greek economy and even of Greek society. If anything, the new debt projections - which put debt at 172% of GDP in 2012, make the task look even harder. The idea that Greece will somehow raise money in a few years when debt will top 160% of GDP could prove a stretch - the government needs to have accumulated plenty of goodwill by then to do so. The deeper challenge is political. In a sense, the status quo of recurring uncertainty have been beneficial for both Greece and for Europe - any of the alternatives would have solved economic problems by creating political troubles. Without pressure, Greece would not reform; and without tangible reform, Europe would not release further aid. Europe's aims have been met by this belated second package. What about Greece's? Greece is caught in a deep paradox: on one hand, the government's agenda hinges on demonstrable pain. Otherwise, the case for reform, at least among the public at large, will evaporate. On the other, the government needs some good news - otherwise, it could easily lose its mandate to keep governing. So Greece needs pain to reform but progress to keep reform possible. This will be a hard balance. The extra time gained by the second package gives the Greek government more breathing room, but it could also alleviate some of the pressure for reform. In the end, it all comes down to whether the Greek people buy that their political system has failed and that radical reform is needed. It is still not clear that they do - less pressure could push them to resume their old habits and positions. The onus will be on the Europeans and the IMF to attach strict conditions to every installment and to remind the Greek government of the day that support is not unconditional and to remind the Greek political class and public that real default remains a possibility.